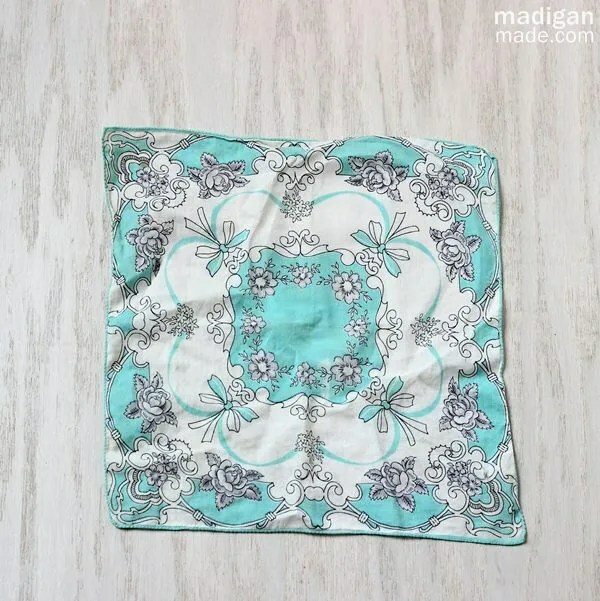 Madigan made… a collection of vintage handkerchiefs for a project. Do you ever head to a flea market or thrift store and come across something you did not have on your list or expect to find… but you ‘needed’ it? And subsequently need ‘more’ of them? Yeah. Happens to me all the time, too! 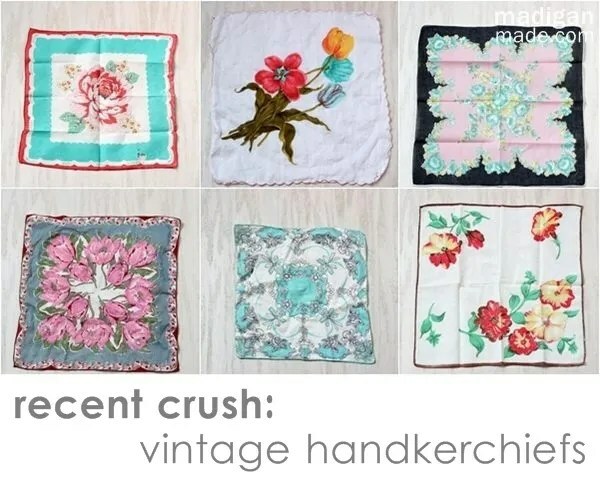 Most recently I’ve developed a mild obsession for vintage handkerchiefs. 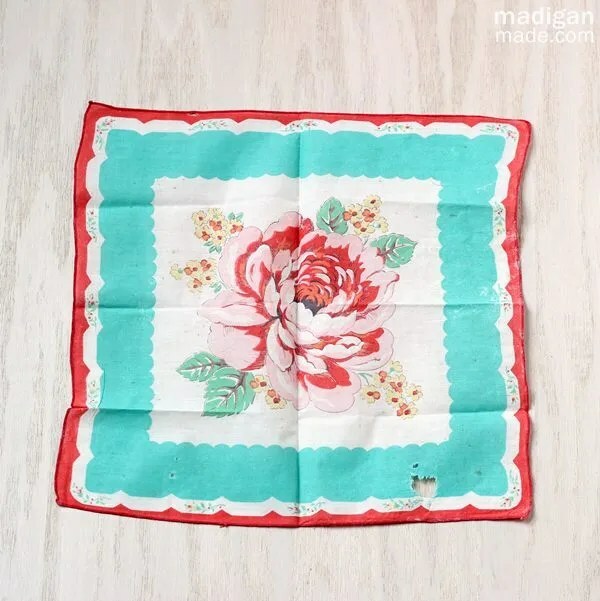 It all started with this handkerchief. I found it at a flea market in Ohio with my mom and aunts last fall. At the time, I was just beginning to think about redoing our family room in a CMYK (cyan-magenta-yellow-black/gray) color scheme. 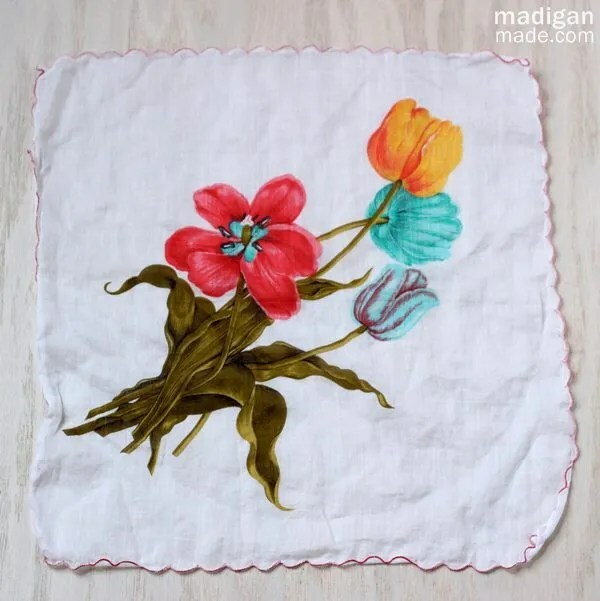 When I saw this crisp botanical-like image on the hankie in the deep pink, blue and yellow colors… I knew I had to get it! So, I started to keep my eyes peeled for other hankies that had a charming pattern AND pinks, turquoise and/or yellow hues in it. I was surprised to see how many hankies I could find with that color palette. Most of them I picked up for about $2-3. This one is just turquoise, white and black/gray… but I love it. The lines are so dainty and crisp. 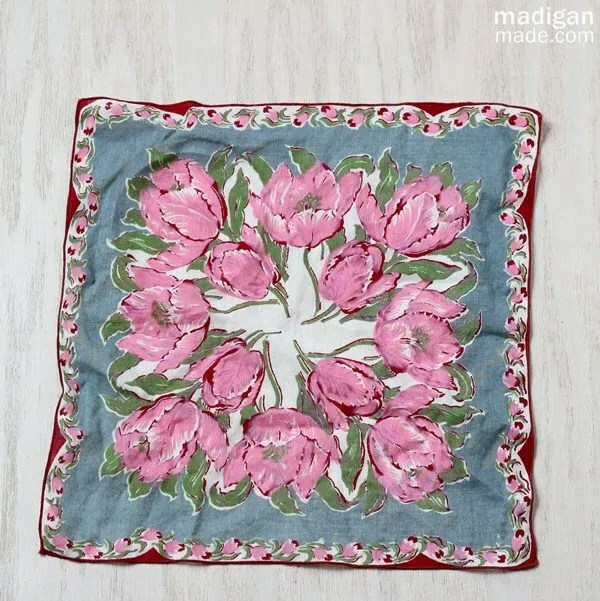 I love the asymmetrical placement of the flowers on this handkerchief. Al the white space is refreshing and feels a little modern. I found it on vacation recently in North Carolina at an antique shop with my mom. 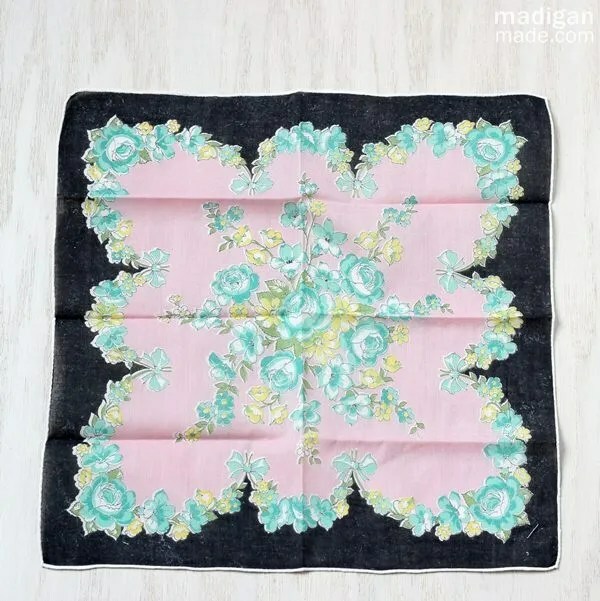 This hankie has a dark, black border which is kind of interesting. 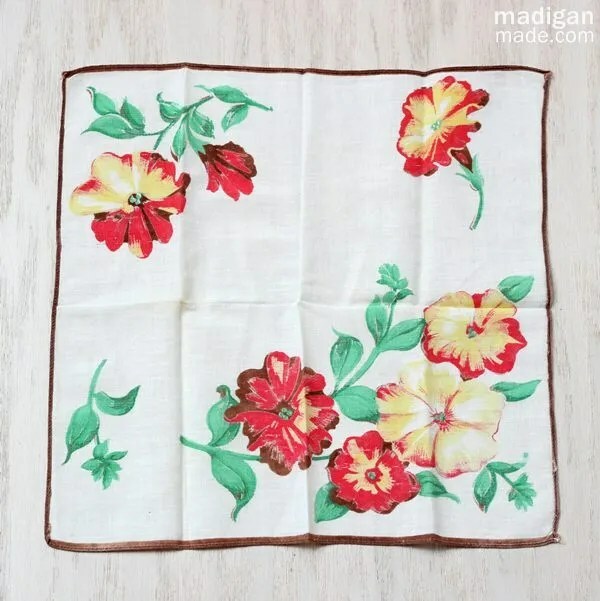 I did not see many vintage handkerchiefs with this deep and bold of a color. And here’s another with with a dark, blue-grey border. I love the mixture of pale pink and deep, dark pinks in the flowers. This one I adore. But I’m afraid to wash it… touch it… or really do anything with it. It is very thin and fragile… with some damage in the corner. But the borders and flower motif were so charming, I had to have it. I’ll just work around that corner for my project. What am I planning to do with these pretty hankies? I have the inkling of a an idea that I hope to execute this summer. I hope to use these beauties in some way for wall art above our new couch in the family room. Stay tuned… If you want updates, please consider following me on Instagram or Facebook because I plan to show more of the work-in-progress there. What things have caught your eye lately? What are you on the hunt for when you go thrifting and antiquing?